Rajasthan Rajwada Cricket League,the biggest professional league for Twenty20 Cricket competition in the whole India after Indian Premier League, one of its kind featuring international players. Rajwada Cricket League (RCL) is a professional league for Twenty20 Cricket competition in India. It was initiated by the Kota District Cricket Association present in Kota under the affiliation of Rajasthan Cricket Association. Passion gives birth to new ideas and ideas if implemented fittingly, come out as best of the inventions. Same has been the saga of Rajwada Cricket League (RCL). After his personal commitments forced him to quit on field cricket a decade ago, decided to stay close to the game through various cricketing activities. Unarguably, the invention of Rajwada Cricket League (RCL) will remain as one of his best brainchild. The league, in its inaugural year of 2016, not only emerged as one of the trend setting event in the history of Rajasthan cricket but also succeeded in setting a yardstick for others. Kota Cricket Team from Rajasthan showcased their cricketing expertise during the span of nine days of non – stop action. An exquisite blend of cricket and entertainment it was. 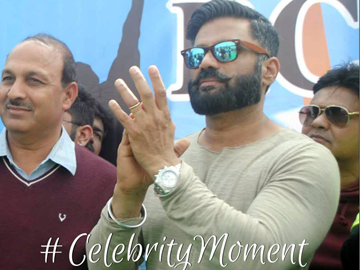 Wherein, bollywood stars Mr. Sunil Shetty and Ms. Amisha Patel beautified the grand opening, it was international cricketer Mr. Mohammad Kaif who graced the final day of the first edition of Rajwada Cricket League (RCL). The vibes of league, in no time, brushed the entire North Indian cricket circle. Truly, it was the Rajwada way of announcing its arrival. The cricket battle ground witnessed six franchisees comprising of many local and international stars from various parts of Rajasthan live on NEO sports. The electrifying ambience and gargantuan assemblage justified the acceptance of Rajwada Cricket League (RCL) amongst masses. The invigorating and astounding support from the crowd forced RCL management to introduce new dimensions to the league in 2017, resulting in two new franchisees in form of Chittor’s Chetak and Jaisalmer Jaguars. Spectators might also see a handful of international cricketers rolling over their bowling arms and banging the white ball in February 2017. KCT Live Score has sure caught the imagination of the nation and world. It has made cricket into a sport which need not be confined to a handful of countries. In a decade from now, a lot of countries could have their own T20 leagues in line with RCL. But that’s not the only success of RCL. It has given opportunities to a lot of cricketers – Cricketers who not only play at the First Class level but also for those who play and excel on the streets of India’s small towns and villages – quite literally.